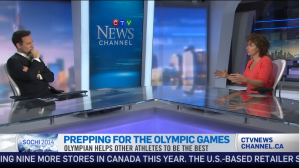 On Jan 29th, I did another TV interview on my mentoring and the security threat from the athletes perspective. Recently, I’ve been asked a lot by the media how athletes are dealing with the distraction of the current ‘security threat’. This makes me laugh – because it seems to me that it’s the media who are the most distracted by it.While a major threat from inside the host nation is different that any of the pre-Games news stories that I can recall – I do believe that the scale of the hype around security can be chalked up to the media’s own pre-Games freak out. At the Olympics, there will be over 10,000 media representatives with almost 100 nations around the world following the Games. Globally the Games promise to take up the lion’s share of February’s news chatter. In May I received a call from the office of the Governor General of Canada, David Johnson, informing me that I would be invested as an Officer of the Order of Canada. It is an incredible honour to receive. I was to keep it confidential until it was announced for July 1 – but of course I told Deanah and my parents right away; Who wouldn’t! Then – as I do with most things – I researched it. The Order of Canada was established in 1967 by Her Majesty Queen Elizabeth II, the Order of Canada is the centrepiece of Canada’s honours system and recognizes a lifetime of outstanding achievement, dedication to the community and service to the nation. The Order recognizes people in all sectors of Canadian society. Their contributions are varied, yet they have all enriched the lives of others and made a difference to this country. The Order of Canada’s motto is DESIDERANTES MELIOREM PATRIAM (They desire a better country). I was to be given the 2nd highest of three levels of the Order. This allows me to put the initials O.C. after my name. 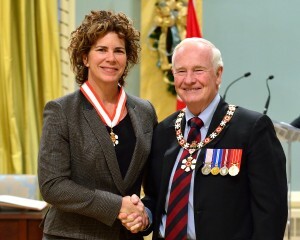 The Officer of the Order of Canada recognizes a lifetime of achievement and merit of a high degree, especially in service to Canada or to humanity at large.